6mr - Rauhallista vuodenvaihdetta ja menestyksellistä Uutta Vuotta! 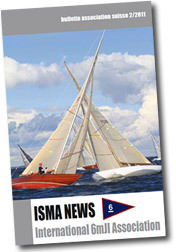 "You hopefully find some interesting information again in this ISMA news. Enjoy reading it. By the way: please excuse the late release of this issue. My notebook was stolen October and I lost a huge part of the prepared bulletin that had to be re-edited. Best wishes, have a good wintertime and an excellent start in the New Year."